Side view of Changó’s altar. Considered to be the most 'popular' of the orishas, Changó rules over lightning, thunder, fire, drums and dance. He is a warrior Orisha with quick wits, temper and is the epitomy of virility. He is an extremely hot blooded and strong-willed Orisha that loves all the pleasures of the world: dance, drumming, women, song and eating. His colors are red and white. His numbers are four and six. To the left of the turin is a Changó figure a libation bowl and rattle to call him down to earth. In front of the rattle is a hand carved turtle figure, Changó is fond of turtles. 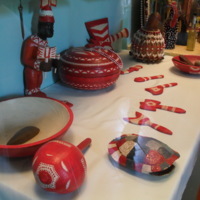 To the right of the turin is Changó’s axe and his red and white beaded shekere (gourd). Francisco G. Gómez, “Altar for Changó,” Raíces Cultural Center Digital Archive, accessed April 25, 2019, http://www.raicesculturalcenter.org/digital-archive/items/show/105.